Brueghel, Children's Games, Oil on canvas, c. 46 inches x 63 inches, 1560. 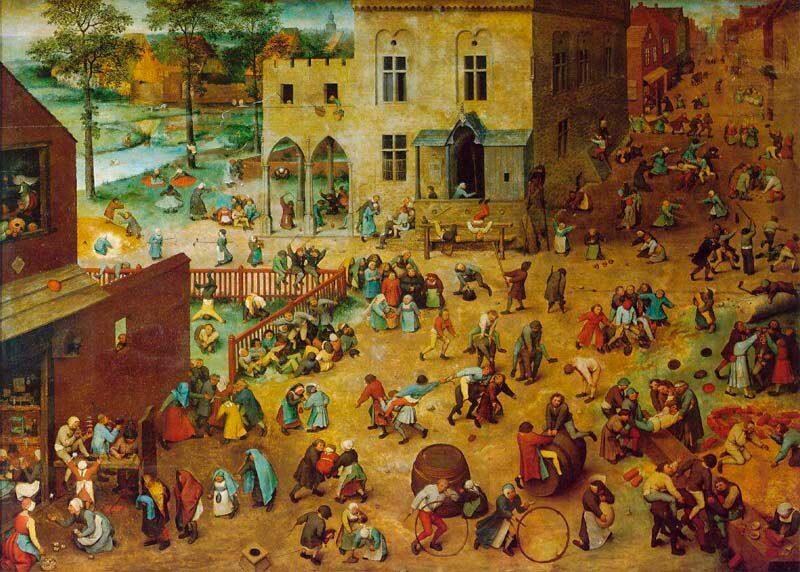 In the painting, Brueghel depicts over 200 children engaged in over 80 play activities. Not all of these play activities are games in the strict sense. Of these activities, over 20 children's games are individually illustrated and discussed on this Website. Many of these games are still played today. Brueghel painted these games in 1560.
unattractive as these children are in themselves, their total surrender to the joy of playing, as communicated to us by Brueghel, would evoke a smile of secret connivance in even the severest of schoolmasters. Brueghel painted an entire town inhabited by about two hundred fifty children. At first the image seems to capture a holiday, but soon it becomes clear that the painting is meant to be an encyclopedia of children's games. Because most of them are still played today, eight-four have been identified, while others not known to the twentieth century have yet to be recognized. Brueghel did not want to emphasize one game above the others. Not able to crowd them all up front, he painted them as if looking down at them from above so that none is blocked from view. While the distant children are smaller than the ones up front, their costumes are still bright. No matter where the children are, even in the shadows, Brueghel painted them as if they were in the noonday sun... At first it looks as though the boys and girls are scattered at random, like jacks thrown on the ground. Brueghel knew how to organize large crowds into patterns. The figures in the foreground of the painting are arranged in lines that fan out from the lower left corner and catch the viewer's eye first. Of course, being formed of children, the lines refuse to be exactly straight! 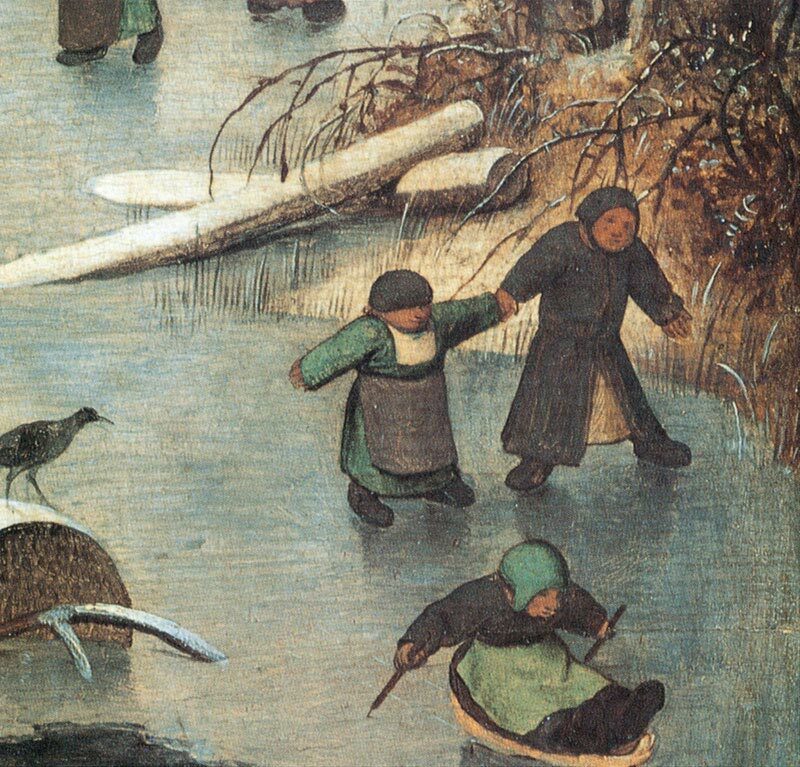 The youngsters in the street behind them are placed in small groups that form a back-and-forth curving line... Brueghel made all of the children's faces similar. Differences in clothing are slight, and not many colors are used. But each child looks like an individual because of the way the artist painted bodies: No two are alike. After all, it is in the figures' movements that the viewer can tell what games are being played. By focusing not on personalities but on the games, Brueghel gave them a universal meaning.